‘As a professional footballer I must rise above [verbal abuse] says the Shamrock Rovers midfielder. 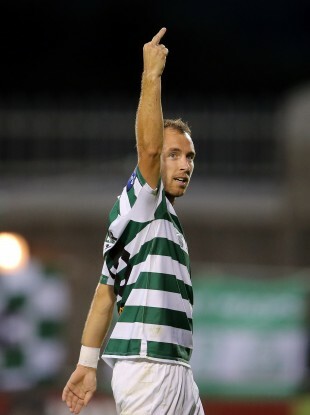 Sean O'Connor has apologised for this gesture on Friday evening. SHAMROCK ROVERS MIDFIELDER Sean O’Connor has today issued an apology for the gesture he made in the direction of St Patrick’s Athletic fans in the wake of his sending off on Friday evening. In the 53rd minute of the game, which Rovers lost 4-0, the former Pats midfielder received a red card for a foul on Chris Forrester. In a statement issued today, O’Connor says he now regrets his behaviour after getting his marching orders. “During the course of last Friday night’s match against my former club, St Patrick’s Athletic, an incident occurred that I now regret and I wish to explain. “It was a very competitive occasion which ended with an extremely disappointing result for my club. Following the red card I received, I reacted in an inappropriate manner. “The gesture, which was clearly unacceptable, followed from my own frustration at being sent off and was in response to verbal abuse I had received from St Pat’s fans throughout the game and which intensified at that moment. Email “O'Connor sorry for 'unacceptable' gesture at Pats fans”. Feedback on “O'Connor sorry for 'unacceptable' gesture at Pats fans”.